Sam Shepard's fiery play, Fool For Love, is the first collaboration between Calgary's Sage Theatre and Edmonton's Shadow Theatre. Judging from the reaction to Wednesday's preview performance, it's a marriage of theatre companies that is well worth nurturing. Presumably any kinks had already been worked out of the performances during the Edmonton run, because the preview at Sage Theatre was exceptionally polished. The one-act play unfolds in a shabby motel room in the Mojave desert. Outside, visible through the cheap blinds that adorn the windows, a parking lot and cacti provide the only distraction from the sparsely furnished room with the peeling wallpaper. Willie Nelson fittingly wails out his heartache as we take our seats. 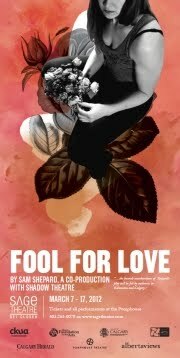 Fool For Love is a short play, only 65 minutes long. But those 65 minutes are so consumed with raw passion and the fallout of toxic relationships that, had it been any longer, our heads would have exploded. May and Eddie are the on-again off-again lovers who are embroiled in a fiery relationship that reveals itself to be increasingly disturbing, as the layers are gradually peeled away. While May and Eddie attract and repel each other like two crazed magnets, poor hapless Martin, May's new gentleman friend who comes to take her out to the movies, is forced to be a captive and silent witness to their drama. Throughout it all, The Old Man sits off to the side in a rocking chair, a sort of dirt cowboy Greek chorus who challenges the two lovers' perception of their shared yet conflicting memories. He is the epitome of their troubled past, fraught with betrayal and abandonment. Each actor in Sage/Shadow Theatres' production of Fool For Love nails perfectly the passion, fury, and confusion of people who are caught in a tangled mess where the sins of the father inevitably revisit the child. The troubled drifters of this desert wasteland will haunt your soul for days to come. Go see this. Excellent use of pre-show music. The minute I stepped into the theatre, I had Rhinestone Cowboy flashbacks. It set the tone beautifully. It's been ages since I've been to live theatre! I like the idea of short but jam-packed. I love the moment when you first enter the theatre,SME, and soak in the ambiance and the possibilities of the stage. The music that is playing is a huge part of this, and something that Sage has always done really well. I agree, Mr Anchovy. It's kinda awesome to get home before 10:00, I'm not gonna lie. Sounds like a great play. I really must get to the theatre soon. I know we're going to go when we visit Europe, but I do love going to local productions. I love local productions as well, Al, you get a real feeling of ownership with a company that you have been following for years. But on the other hand, you'll have a chance to see some really unique productions in Europe! Lucky you. I know I must have read that one ages ago. An hour play really appeals to me especially if I don't have to travel far to get there and a few good eateries are nearby. Sounds like a very interesting play--I have never heard of it before. I've only seen a couple of Sam Shepard plays, Vicomtesse, but they have both been wild romps. Next time I must remember to stop at an eatery as well. I didn't know this one before I went either, Pilgrimchick.